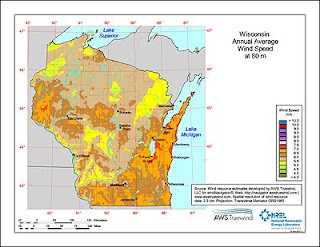 The Department of Energy's Wind Program and the National Renewable Energy Laboratory (NREL) published a new wind resource map for the state of Wisconsin. The new wind resource map shows the predicted mean annual wind speeds at 80-m height. Presented at a spatial resolution of 2.5 km (interpolated to a finer scale for display). Areas with annual average wind speeds around 6.5 m/s and greater at 80-m height are generally considered to have suitable wind resource for wind development. Additionally, a national dataset was produced of estimated gross capacity factor (not adjusted for losses) at a spatial resolution of 200 m and heights of 80 m and 100 m. Using AWS Truewind's gross capacity factor data, NREL estimated the windy land area and wind energy potential in various capacity factor ranges for each state. The table (Excel 75 KW) lists the estimates of windy land area with a gross capacity of 30% and greater at 80-m height and the wind energy potential from development of the "available" windy land area after exclusions. Though difficult to see on the small image above, an area around in St. Coix County stands out for wind speeds higher than much of the rest of Wisconsin.